It's that wonderful time of year, cold and flu season. I'm hoping that my family will be spared the worst of it this year since last year I spent part of my Christmas Eve in a CVS MinuteClinic with the worst flu I've ever had in my life! I basically missed Christmas with my family since I was so sick. But I was very grateful that I could see someone at CVS on Christmas Eve when my primary doctor was closed. I've actually been to the MinuteClinic at CVS 3 times in the last year. I love that it's convenient; I was seen on Sunday and on Christmas Eve. The time I was seen on a Sunday I was prescribed a z-pack which I started right away. By Monday morning I was already feeling a little better when my husband went back to work leaving me at home with three small kids to take care of. When you're a mom, getting better fast is a huge priority. 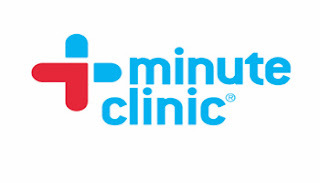 For those of you who have never been to a MinuteClinic the first thing you need to know is that it's a walk in clinic that's available in 28 states and the DC area. They do not take appointments and they are opened 7 days a week with weekend hours. The wait time in my experience isn't that bad. The only time I had to wait for a long time was when I went on Christmas Eve. The other two times I was seen in less than 30 minutes, which is faster than my primary care doctor when I do have an appointment. Now that it is cold and flu season, the ERs are busy and you will wait a long time to see a doctor. A CVS MinuteClinic is a great, affordable option to get medical attention when you cannot get into see a doctor. I don't know about your family but my kids are famous for getting sick on a Friday afternoon. Also, my insurance charges a higher co-pay at an ER so going to the MinuteClinic saved me money. Saving money is always a plus in my book. Of course the best part about being seen inside a pharmacy is that you are right there to fill your prescriptions or stock up on any OTC medications you need. You can also get your flu shot at MinuteClinic to help you stay healthy this cold and flu season. Check on CVS's website and see if there is a MinuteClinic in your area.